Raaga.com: Aamir Khan Saves DIL DHADAKNE DO cruise from drowning! Aamir Khan Saves DIL DHADAKNE DO cruise from drowning! Do not get surprised because though Zoya Akhtar’s third film DIL DHADAKNE DO may have a huge star cast of Anil Kapoor, Ranveer Singh, Priyanka Chopra, Farhan Akhtar and Anushka Sharma but none could save the film DIL DHADAKNE DO from drowning at the box office due to its dreary long narrative but thankfully the saving grace of the film is none other but Aamir Khan! Yes Aamir Khan!! Though the brilliant actor may be not present in the film physically but his voiceover for the Mehra family's pet dog has left the audience in peals of laughter and is the prime reason for the movie’s success. According to film trade pundits the movie opened to a lukewarm response (Surprisingly despite a multi star cast) with a mere 25 to 30 per cent occupancy on Friday that too only in Metro cities but due to word of mouth publicity about the hilarious voiceover by Aamir Khan for Pluto Mehra, the bullmastiff dog of Mehra family the box office collection saw an instant rise. Trade analyst Taran Adarsh informed that DIL DHADAKNE DO collected a modest Rs10.53 crore on Friday but with word of mouth publicity the collection picked up and showed a good jump on second day at the domestic box office as the film collected Rs 12.27 crore on Saturday. The two-day box-office collection of DIL DHADAKNE DO stands at Rs 22.80 crore. Pluto Mehra, the bullmastiff dog is the backbone of the movie as he is the narrator of the story and gives it a philosophical twist, making the tale absorbing and believable with his sarcasm comments at appropriate situation sending the audience in laughter and at times compelling to ponder. 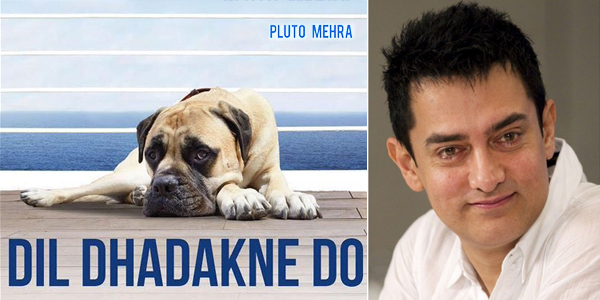 Readers would be surprised to know that initially Javed Akhtar, eminent lyrist, scriptwriter and father of Zoya Akhtar had dubbed for Pluto but when Zoya narrated the character of Pluto to Aamir Khan, he was bowled over by of Pluto’s satirical character and literally jumped up to give voiceover.